The Mouths of the River Anduin, otherwise known as the Great River, are located in Gondor. The majority of Anduin, however, is not in Gondor, but in Rhovanion. During the Quest of the Ring, the Fellowship sailed down the Great River towards Mordor, and departed from it near the falls of Rauros. Many great cities were built on the coasts of the Anduin river, including Lórien and Minas Tirith. These mountains form the northern border of Gondor from the rest of the world. They run west almost to the sea. These mountains were, long ago, the home of a race of men called Dunlendings. By the Third Age, only refuges of the Rohirrim and the Gondorians lived there. Just north of these mountains is Rohan. Many small rivers have their sources in the Ered Nimrais, including but not limited to Ringolo, Morthond, and one of the two tributaries of the mighty Isen river. This is a hilly region of Gondor, and it is thought to have been mainly uninhabited. This region is just north of the shores of Anfalas, or Longstrand. "The Fenced Land," or the Pelennor Fields, is the fertile grassy area surrounding Minas Tirith. A significant battle in the War of the Ring was fought here; The Battle of Pelennor Fields. 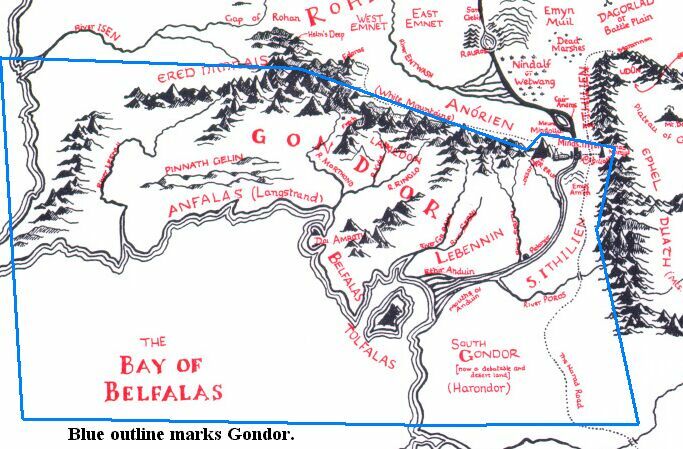 Belfalas is a small, coastal peninsula just south of the land of Dol Amroth, the land of the Princes of Gondor. It was most likely very fertile, though not vastly populated. Tolfalas is an island in the bay of the Mouths of the Anduin. It is large and mountainous, and it is nowhere recorded whether it was populated or not. The Bay of Belfalas is a mighty bay, the largest in all of Middle-earth. All rivers who find their source in Gondor empty into this bay. There is much marine life in this area. South of this bay is the region of Umbar, and the Havens and Great City of Corsairs. Little, other than the name and size, is known of these havens. This is the most questionable piece of land in Middle-earth history, for it was deserted and thereafter unrecorded in the early Second Age. It is only known that now this land is a great and vast desert that is almost completely unpopulated by men, elves, or dwarves. Hobbits did not even know of the existance of this land.